Sunday October 21st 1883. Was busy about the work all the forenoon I wrote a letter to Will Reed after dinner and in the evening. I talked with the boys in the parlor. 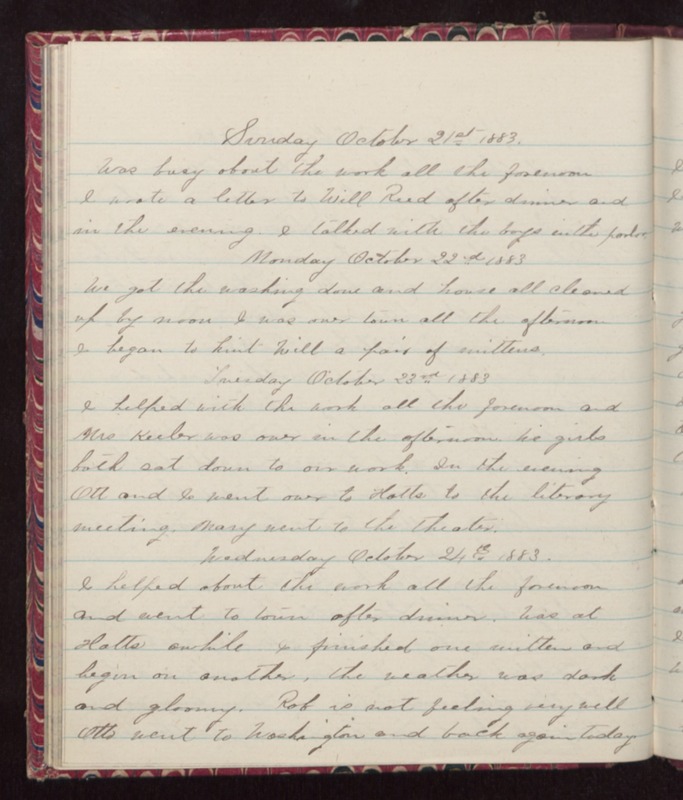 Monday October 22nd 1883 We got the washing done and house all cleaned up by noon I was over town all the afternoon. I began to knit Will a pair of mittens. Tuesday October 23rd 1883 I helped with the work all the forenoon and Mrs Keeler was over in the afternoon. We girls both sat down to our work. In the evening Ott and I went over to Hatts to the library meeting. Mary went to the theater. Wednesday October 24th 1883. I helped about the work all the forenoon and went to town after dinner. Was at Hatts awhile I finished one mitten and began on another, the weather was dark and gloomy. Rob is not feeling very well Otto went to Washington and back again today.